The title says it all really … in the last 2-3 days since being home I’ve locked myself away from the world and just stitched my little heart out. It has really done me the world of good and today I feel a lot more relaxed and back to ‘normal’ again (what ‘normal’ actually is!). Then I moved on to my Canvaswork rotation slot … the last time I started this one (Blue Bayou by Northern Pine Designs) I found the WDW pearl cotton that was supposed to be PC#8 was actually PC#5 (it was mislabelled), and it really showed up with my stitching … so my first job yesterday was to unpick the original pearl cotton stitching … which ended up being a challenge in itself! Because the waffle stitch has so few threads on the back to weave into, I’d managed to thread through a few stitches adjoining it, and it ended up being such a tangled mess trying to unpick I just ended up frogging those as well … which left me with 3 very small bands of metallic threads left. Once I started stitching, though, I set the stopwatch going and really got into the rhythm of this one. It’s one of those projects when you wake up in the morning and turn over to see your stitching on your stitching stand and it makes your spirits soar straightaway! 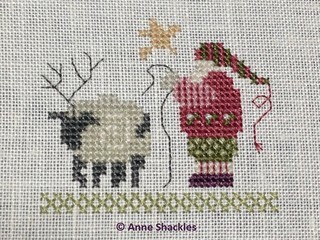 Anne S • This entry was posted in Canvaswork, Christmas Ornaments, Finishes, Little House Needleworks, Northern Pine Designs, Shepherd's Bush, Works in Progress. Bookmark the permalink. ← Flossy is finally finished!!! It’s so gorgeous! The colours, the stitches! Everything looks so fantastic. Anne congratulations on two wonderful ornament finishes! Your canvaswork is just stunning!!! You definitely needed that time out. 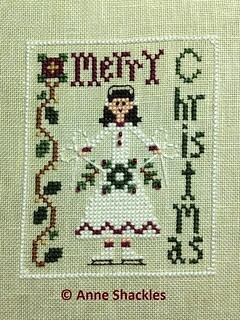 Glad you got it, and man you’re a speedy stitcher!